​Just a few weeks ago, my husband and I were enjoying some time away in the mountains of New Mexico. The bright golden color of aspen trees with changing leaves combined with the cool crisp air was soul refreshing for this Texas girl. Although it was still hot at home, there in the mountains, my favorite season was in full display. Yes, my favorite season. But not for the weather, although the cooler temps are very welcome after 100o summer days. And not for the colors, even though there is nothing like the beauty of the fiery red and golden leaves fluttering in the breeze. No autumn is my favorite time of year because as the season changes, it seems attitudes also change and a sense of “gathering” sets in as the holidays are just around the corner. True thanksgiving, though, is so much more than a holiday or a by-product of changing seasons. 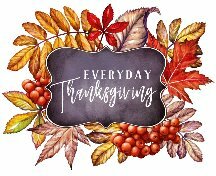 True thanksgiving is a heart condition displayed in our normal day to day life. 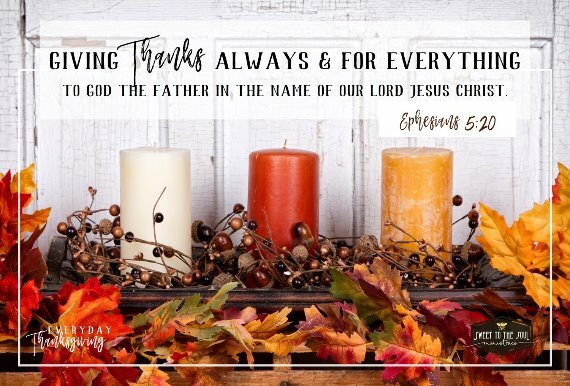 True thanksgiving is everyday thanksgiving. When we say “thank you” to someone is it typically for something - something they’ve said that made us feel good or something they’ve done which we appreciate. This is a lovely and right expression. But this isn’t the type of thanksgiving we are called to by God’s Word. Biblical thanksgiving is much deeper than a mere expression or note card. Biblical thanksgiving is not based on our circumstances, it is in spite of our circumstances. good or bad, easy or hard, beneficial or costly. short or long, calm or stressful. Celebratory or mournful. Soul Friends, I would love for you to join us during November each day on the blog and social media. 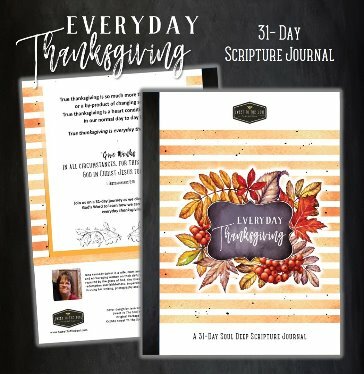 I look forward to this 31-day journey through the Bible as we dive soul deep each day in to God’s Word to learn how we can live a life of everyday thanksgiving. 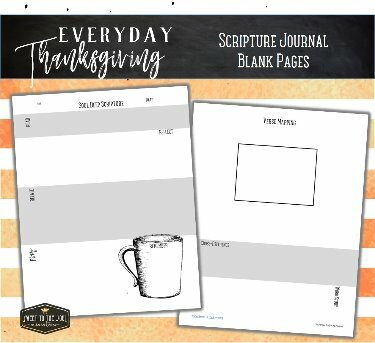 ​There are a couple of ways to use this Scripture Journal. But either way is at your own pace. If you’ve just got 10 minutes, go ahead and dive in; and if you’ve got more time, then let’s get soul deep in the scriptures. So, grab your Bible, a pen, some colored pencils or highlighters – and let’s dive in! 3. Personalize it: replace words like “you”, “we”, “us”, “them” with your name. 4. Mark, circle, underline, highlight words and phrases that stand out to you. Any words make you want to dig deeper? Look up and define any words that need clarification. 5. Read the verse in context: read the preceding and following verses or whole chapter. See how it ties in to the verses before and after it. understand or apply the verse. 7. Cross-reference the verse: find, list and read other verses which speak about the same topic.